Description: The Red has hosted many prestigeous tournaments and hardly a bad word has been said about it. Although easier than the Black -- which curries favor from high- and mid-handicapers -- the Red is far from a pushover. It starts off in impressive fashion with an imposing, uphill 474-yard par-4 that has no bunkers -- and it doesn't need them. The parkland look of the Red Course at Bethpage. Noted for its long par-4’s, many of them doglegs, and a grueling stretch on the back nine with 13, 14 and 15, the course requires both length and accuracy in from drives and approach shots. One of the most interesting holes in the whole park is at No. 13, where a bunker complex divides the fairway and makes for a decision into an angled and well-bunkered green. Playing with some holes that are treeless, and some that are tree-lined, makes for an interesting round, and one of the best in the area. Reader Comments: As a 15-20 handicap, I’d rather play here than the Black ... Never boring ... Always beautifully maintained ... 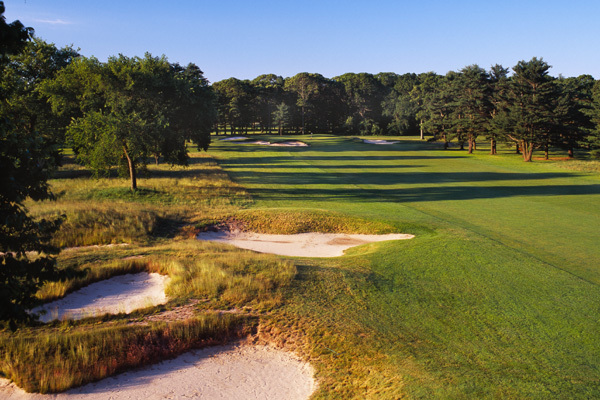 Some of the toughest par-4s anywhere on Long Island ... The greens are flat, but are still interesting. 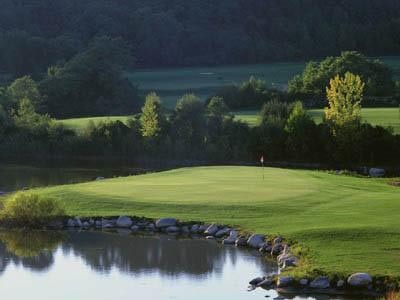 Description: So unique for the area, this course was built on the former site of a gravel and sand mine on the North Shore of L.I., making for beautiful elevation changes and drastic, visually stimulating golf. On the edges of the course are huge, 100-foot-high dunes - now covered with shrubbery - that used to be the edge of the sand pits and can be seen throughout the round. It creates a feeling of privacy, like you could be in the middle of the Arizona desert. There are three holes on the course that have split fairways, which allow for some interesting decision making off the tees. As a whole, the par-4s are long, the par-5s are wonderfully risk-reward, and the par-3s are an aesthtic delight. (No. 17, a 207-yard gem with a quasi-island green was even better before the towering apartment complex was built next to it). Reader Comments: An absolute joy from the minute you walk in the (new) clubhouse to the minute you walk off the golf course ... A great round of golf, and so different from everything in the area ... I love the split fairways, and the course was in tip-top condition.